Back again with another of my Christmas cards. This is another image from Mo's Digital Pencil, called 'Winter Fairy Halla'. 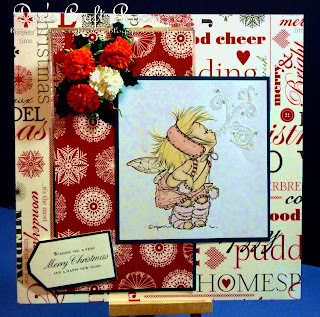 As always, I have printed the image onto Crafty Boots Deluxe Crafter's Card and coloured it with Promarkers. I then added a little glitter. I just love this image and I love how you've coloured her -perfect. I'm intrigued by those flowers in the corner - are they Wild Orchid crafts?